I started yesterday (Saturday) with a traditional Laos massage, in which I was contorted and twisted in ways never before seen in the Western world. 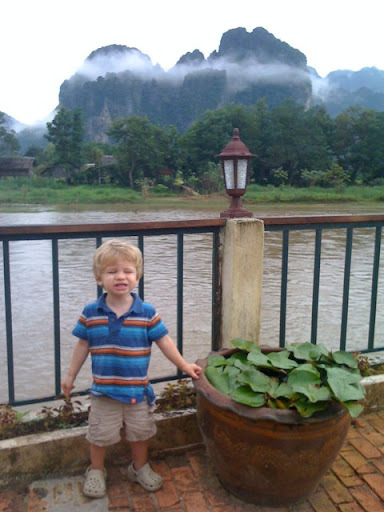 As my muscles both recovered from and relished in the aftermath of the massage, we headed out in a minivan with a hired driver from the flatlands surrounding Vientiane into the rough and mountainous road leading to the town of Vang Vieng. This was our pitstop on the way to Luang Prabang, further north in Laos. But it turned into more than a pitstop really. We stayed at a beautiful bungalow named Nam Song Resort along the Nam Song (Song River) with jagged, cone-shaped mountains surrounding us. We had delicious red curry, tom kai gai soup and other Thai-inflected dishes for dinner and woke up to a misty morning and our first bacon and eggs breakfast since we've been in Asia.